We have begun collaborating with Warrior Writers, a collective dedicated to bearing witness to the experiences of war veterans and healing through artistic expression. 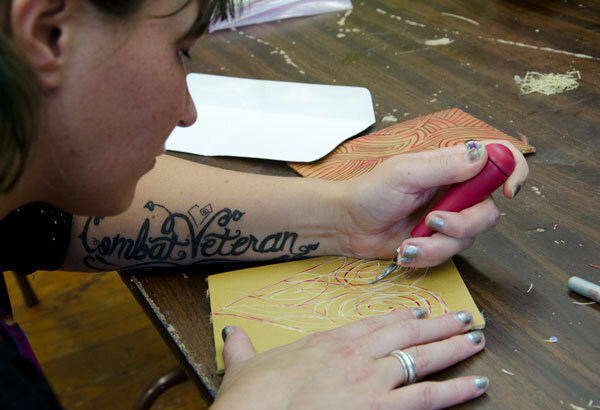 This past weekend, Warrior Writers held a Veterans and Community Conference, which was co-sponsored by the University City Arts League in West Philadelphia, and included a series of workshops for veterans and civilian allies on writing, art-making, and various veterans issues. Anand teamed up with Jon Olshefski again to film the Saturday workshops and evening performance, and they co-taught one of the workshops on photography/video training. On Sunday, Anand and one of our interns, Andrew Wimer, filmed the group performing volunteer work at the Veterans Comfort House on Baltimore Avenue. In the coming months, we will continue filming with Warrior Writers as they install and dedicate a veterans mural as part of the City of Philadelphia Mural Arts program. The title of the mural is Communion Between A Rock and A Hard Place.